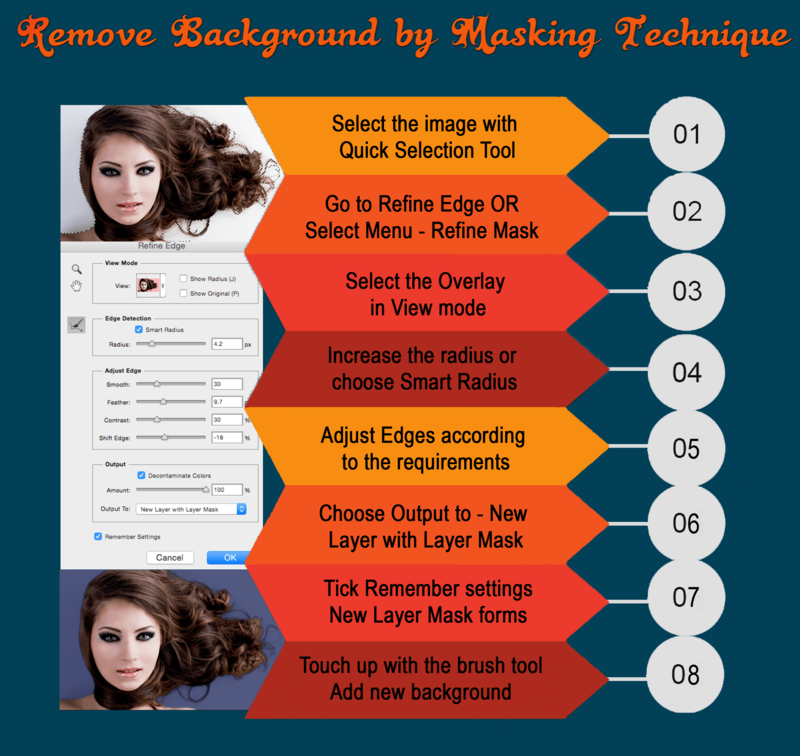 This info-graphic tutorial on hair masking technique will teach you how to remove background from a model image with hair. The importance of hair masking technique is great in the field of photo editing. You may have not any problem for non hairy images to remove background by clipping path service. But when an image is with hair or fur, only clipping path service will not be sufficient to remove background perfectly. You can create rough path around the hair portion but that will not bring good hair extraction result. In this case you should follow Photoshop hair masking technique to extract the hair properly and remove background. So, hair masking technique is must to learn remove background from hair images. 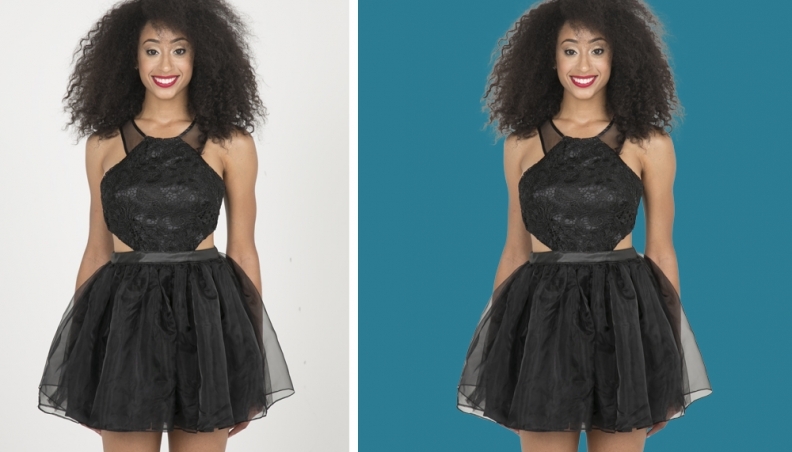 A designers can have basic knowledge on clipping path service, drop shadow, photo retouching, image manipulation service and he can use those technique to provide satisfactory photo editing service. But if he hasn’t vast knowledge on hair masking technique, he will not he able to remove background from hair image or furry images. To get enough knowledge oh hair masking technique one has to practice a lot and sometimes he learns through several mistakes. He should have enthusiastic mind to be master on masking service. He must follow some rules of hair masking and practice more and more. If he struggles, sure he will be a perfect and experience designer. He can easily provide good quality service to his clients with the help of hair masking technique. Our main intention is to help the people who really want to know or learn something on hair masking. We want to show how to remove background from hairy or furry image. And if he follow those easy and simple ways step by step, he will be able to remove background from any kind of complex or simple hair images. We have tried to present this tutorial in a very simple way so that a beginner can follow this and apply quickly. Thank you very much for following our posts. Thank you. It is designed with WordPress. No coding is needed. Thank you very much for following us. Keep in touch for more upcoming posts. Thankfulness to my father who informed me regarding this webpage, this blog is actually amazing. Thank you for following us our blogs. Keep in touch. Thank you very much for your praiseworthy comment.Keep in touch please. Hi to every body, it’s my first pay a quick visit of thiis webpage; this weblog carries awesome and truly excellent data in favor of readers. Thank you very much for following our post. enormous educationawl post here at my residence. They will think that you are awesome or that your enterprise has a ton of buyers. Thank you. Yes, you can share.